100 all-time favourite children?s Bible songs, performed by the Cedarmont Kids. Songs include: 'Jesus Loves Me', 'This Little Light of Mine', 'Jesus Loves the Little Children', 'Father Abraham', 'Joy to the World' and 95 more! Kids and parents will love this special package of Cedarmont Kids videos and audio. Jam-packed with the best-loved Children?s Bible Songs, this collection offers hours of wholesome interactive fun!
? 3 CDs, each approximately 1 hour long. 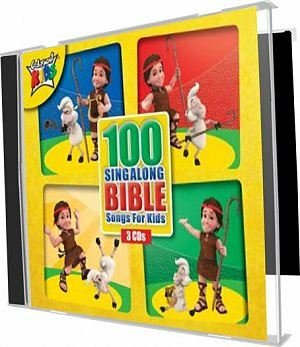 100 Singalong Bible Songs For Kids by Cedarmont Kids was published by Cedarmont Kids in September 2009 and is our 3246th best seller. The ISBN for 100 Singalong Bible Songs For Kids is 0084418071524. Some really good stuff here for a Sunday School - mix of traditional and new style although a few tracks are for under 4s. Need more like this! Got a question? No problem! Just click here to ask us about 100 Singalong Bible Songs For Kids. A:There are all tracks with vocals on them. If you are looking for a CD with backing tracks, then perhaps Cedarmont Action Bible Songs may be what you're after. (https://www.eden.co.uk/shop/cedarmont-action-bible-songs-cd-2710121.html#) The album is on two discs: - The first disc has the full songs to listen to - The second disc has the same songs, but are split so that (if you CD player is able to) you can switch between left and right speaker and hear either just the vocals, or just the backing tracks. A few of the releases by Cedarmont Kids have this function with their albums. Thank you for using the Q&A Forum. Can the words be displayed on the wall with a projector and laptop? If not do you have any like that apart from Hillsong Kids? A:The CDs in this set are produced for playing music only. As well as the ever popular Hillsong Kids products we also have Kids Colossal Jumbo Digi-Songbook http://www.eden.co.uk/shop/kids-colossal-jumbo-songbook-pb-1222481.html This features the facility to print the score from the CD-Rom. Now Playing: Jesus loves me Your browser does not support the audio element.